I had a half of a butternut squash in my fridge that I wanted to use up last night. The first thing that popped into my head was a puree. 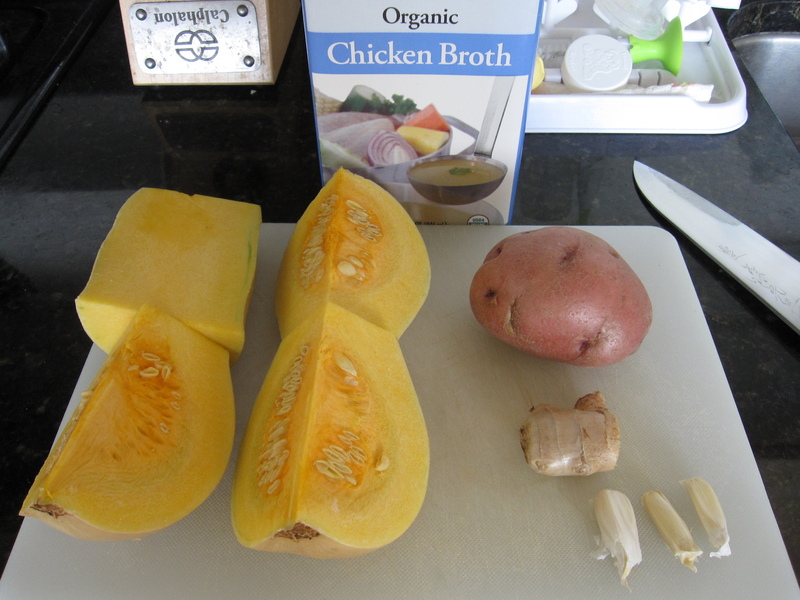 Squash puree’s really well, especially when you add a little ginger and garlic. 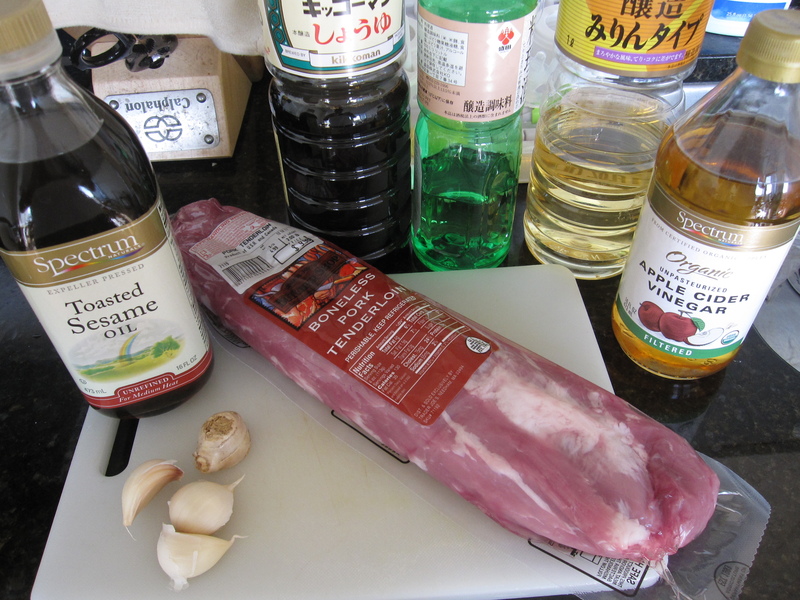 So, Otis and I walked down to Trader Joe’s and grabbed some pork tenderloin to grill up for the protein. Making a puree out of squash is one of the easiest things you can do. I took the squash and removed the seeds and skin then chopped it up. Along with that, I skinned and chopped one medium red-skin potato, 1/2 inch of ginger, 3 garlic cloves, and 1/4 cup of chicken stock. The potato is simply to add a nice smooth texture. In a sauce pan, I threw all of the ingredients together and simmered them over medium-high heat for about 15 minutes, until everything was soft but not mushy. I let it cool down and then pureed it in my little blender. 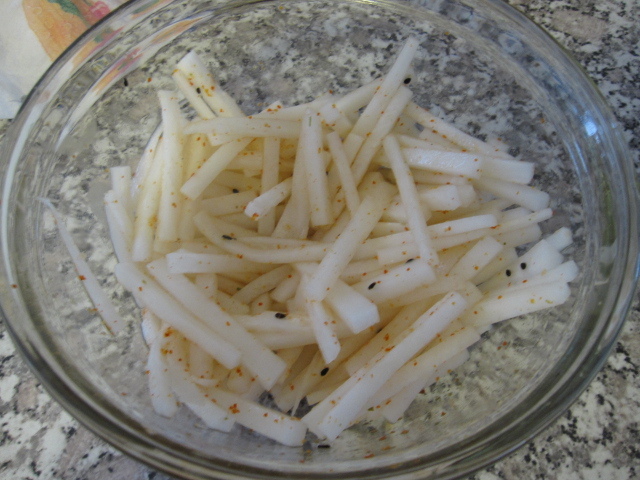 I set about 5 tablespoons aside and then salted and peppered the rest and let that sit aside ready to reheat just before serving. 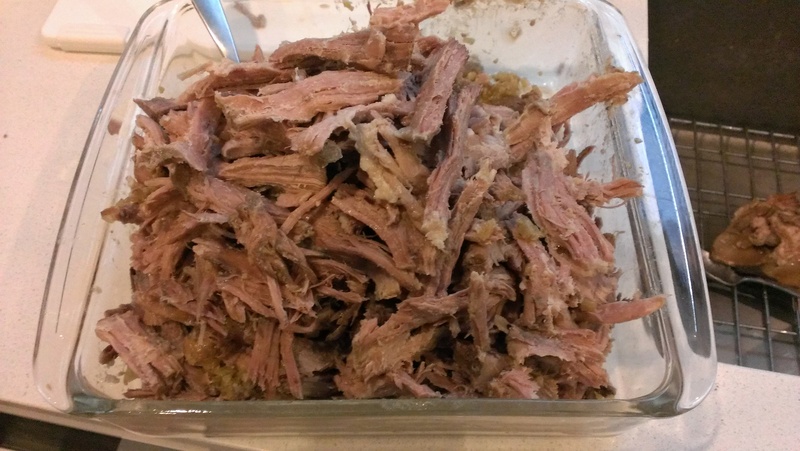 While the squash was simmering I marinate the pork in 1 tablespoon sesame oil, 3 tablespoons soy sauce, 2 tablespoons sake, 1 tablespoon mirin, 2 tablespoons apple cider vinegar, 1/2 inch of ginger grated, and 3 garlic cloves grated. 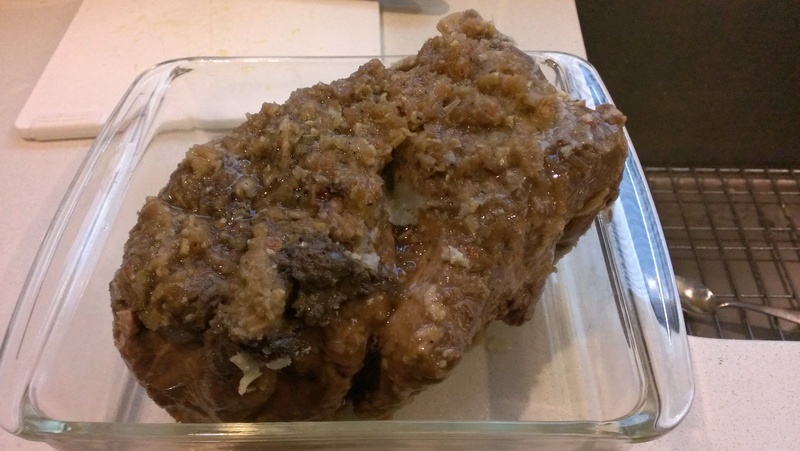 I had 2 lbs of tenderloin and let it marinate in the fridge for about 2 hours, then let it sit out for about 45 minutes before grilling. 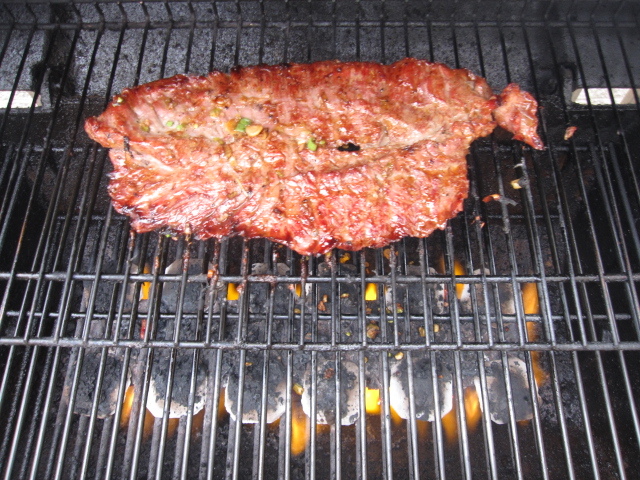 For my grill, about 10 minutes on each side at medium-high cooks it nice and medium with just a bit of pink left in the middle. I let it rest, tented in foil, for about 8 minutes before slicing it up. 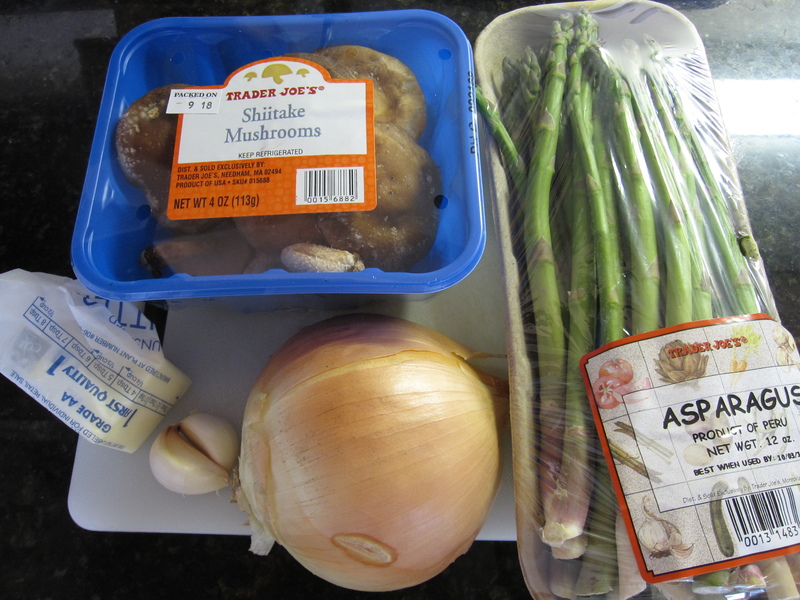 To counter the Autumn sweetness of the squash I sautéed some asparagus with sliced shiitake, 1/2 an onion sliced, 2 garlic cloves minced, 1 tablespoon of butter, and 2 tablespoons of soy sauce. 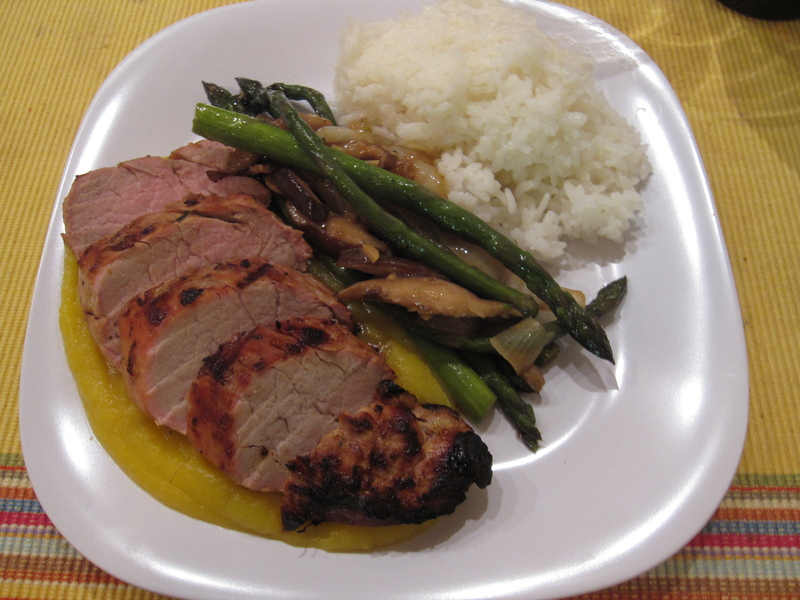 In a medium-hot pan I poured in a couple of tablespoons of peanut oil. I sweat down the onion for about 7 minutes. 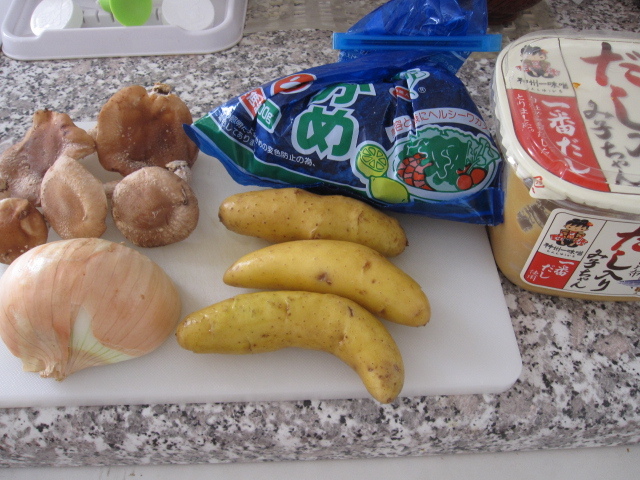 Then I added the garlic and shiitake. I let those cook for about 5 minutes before tossing the asparagus in. Another 8 minutes and I added the butter and soy. I let it all cook together for a few more minutes. so the butter could coat everything, then served it up. Pan roasting asparagus and shiitake with some butter bring out more of the woodsy notes rather than more sweetness. White rice was on the side of course. The night’s triumph, however, was that it was Otis’s first successful adult food feeding! We tried some sweet potato a couple of weeks ago, but it didn’t go over so well. He just wasn’t quite ready. With all the butternut squash puree, we gave it another shot. 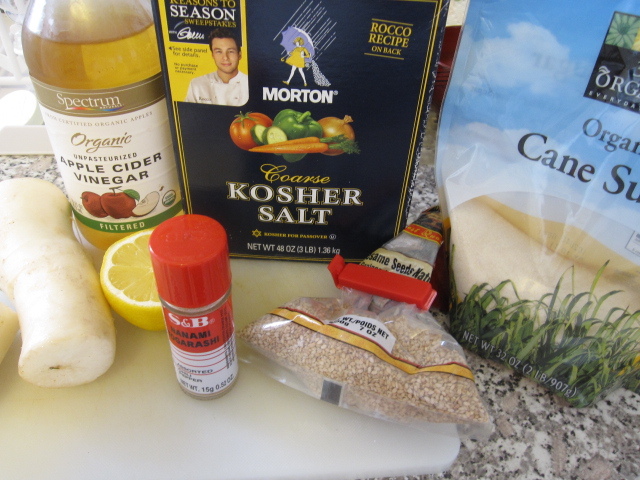 Remember the puree that I set aside before adding salt and pepper? 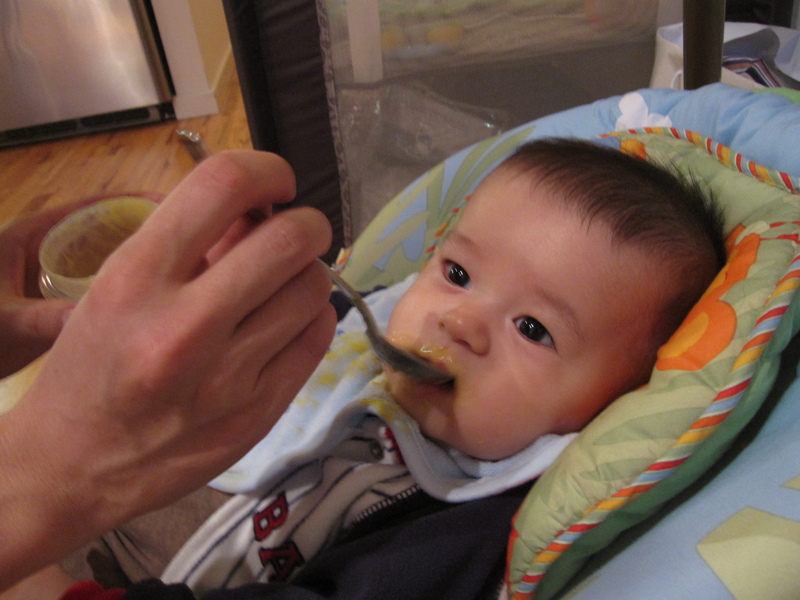 (babies shouldn’t eat added salt) I mixed in about 2 oz’s of breast milk, not from my breasts or he’d get nothing but a hairball, until it was really smooth and thin enough that he could just swallow it down. Sure, his bib got fed too, but he ate the whole thing. I’m sure I’ll have a fun mess to clean up today because of it. But he’s worth it. 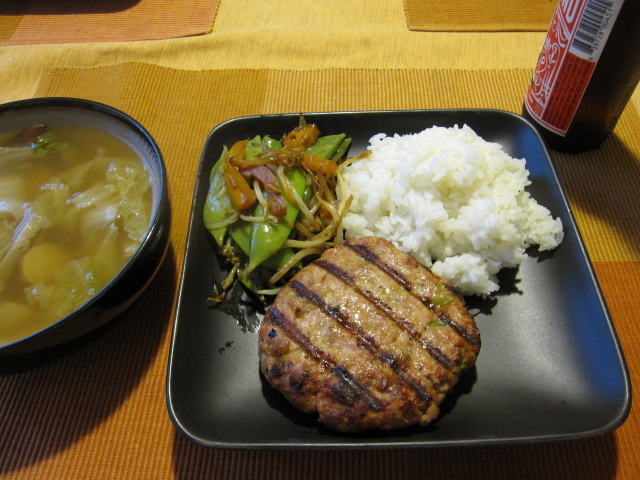 Last night I made a simple burger out of ground pork and one of my usual marinades. 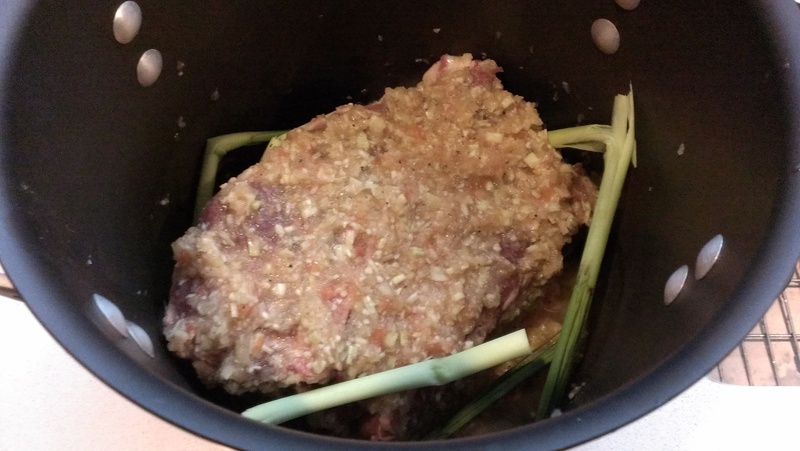 To make it into a burger, I mixed the marinade into the meat for flavor and added some bread crumbs to help hold it together. Grilled up to perfection, these could also be pan-fried or even baked. 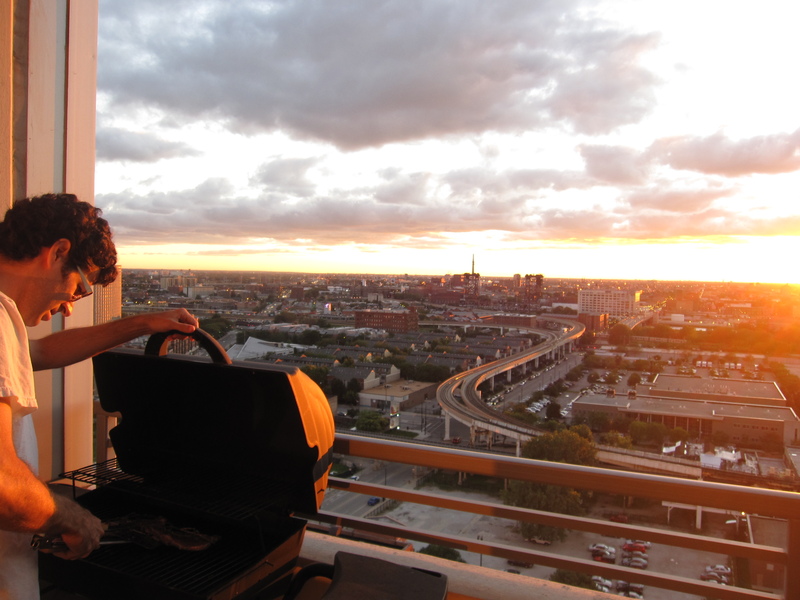 But why when you can grill? 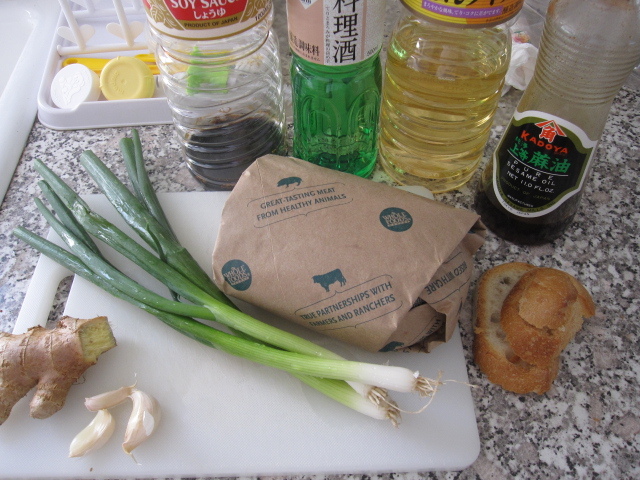 To make the burgers used about 1 inch of ginger grated, 3 garlic cloves grated, 3 green onions thinly sliced (white and pale green parts only), 1.25 lbs of ground pork, a few slices of bread ground into bread crumbs, 1.5 tablespoons soy sauce, 1 tablespoon sake, 1/2 tablespoon of mirin, and 1/2 tablespoon of sesame oil. 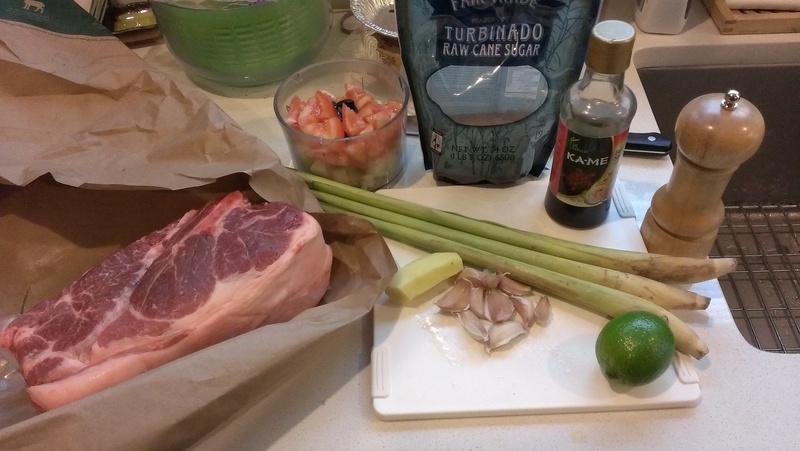 I threw it all into a glass bowl and mixed it together, along with some black pepper, with a metal spoon until the flavors were evenly distributed throughout the meat. By using a metal spoon I avoided having the heat in my hands melt the fat. This helps keeps the burger juicy while it’s on the grill. 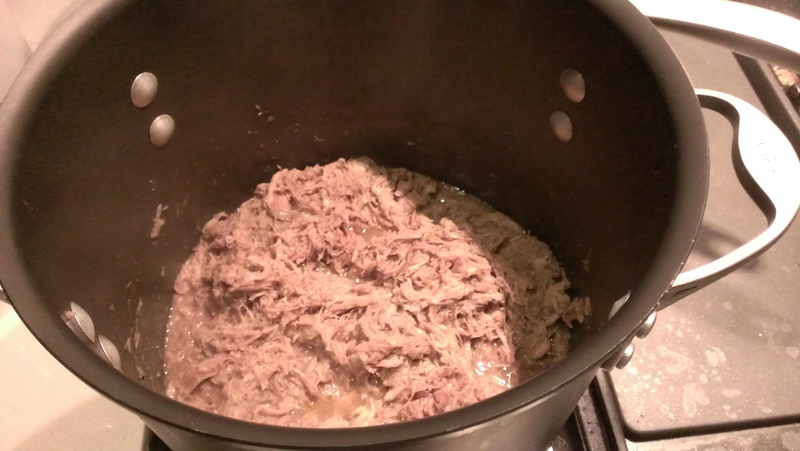 Once mixed, I let the meat for about 10 minutes or so to let the flavors settle. 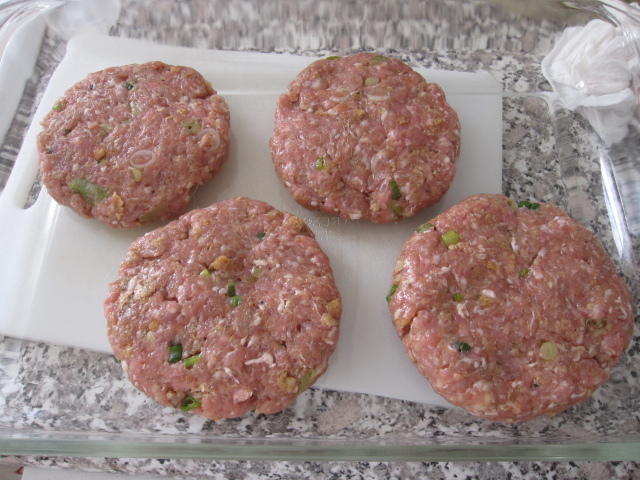 Then, I formed 4 patties and set them aside, covered in the fridge, while I prepared the rest of dinner. To cook, I took them out about 20 minutes prior to grilling. I grilled them over medium high heat for about 8 minutes on each side. 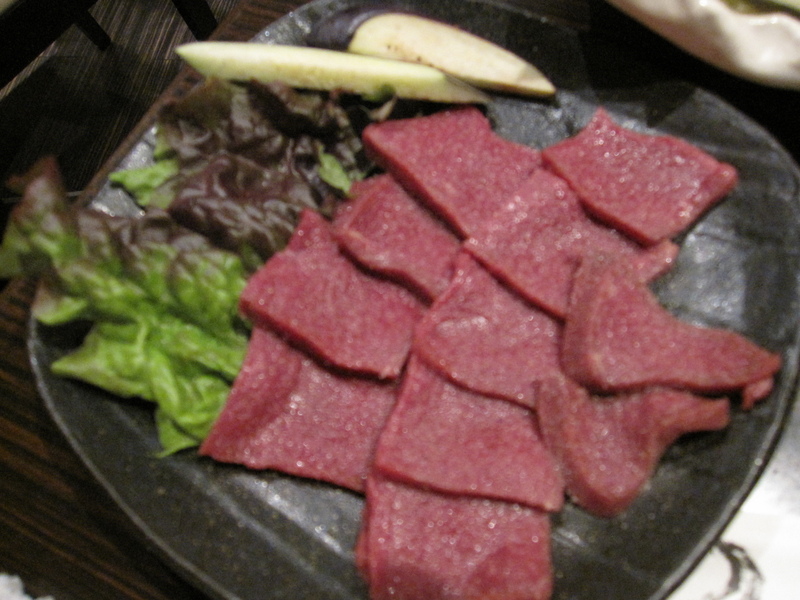 This allowed nice grill marks while keeping it juicy, yet cooked. 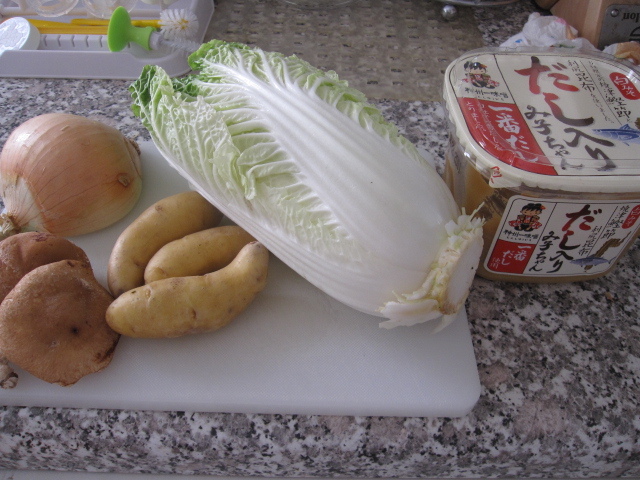 I made miso soup using 1/2 onion sliced, 3 shiitake sliced, 3 fingerling potatoes chopped, 7 leaves of nappa cabbage sliced, and 1.5 tablespoons of miso. 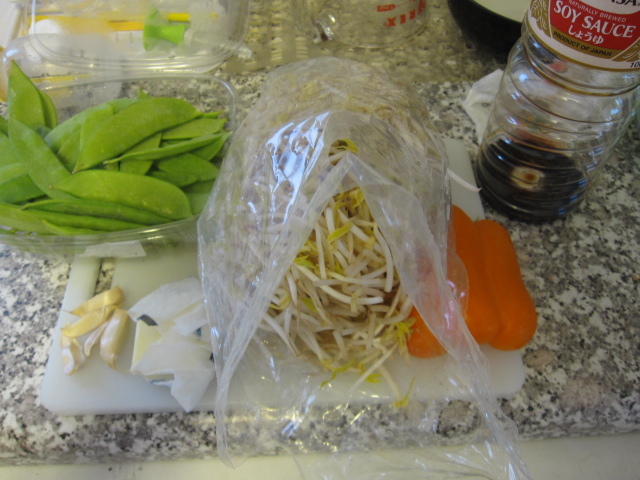 The other side I made was a simple veggie mix of 1/2 pound of snow peas, 5 small garlic cloves minced, 1/2 tablespoon of butter, a handful of bean sprouts, 1/2 orange bell pepper sliced, and 1 tablespoon of soy sauce. I melted the butter in a skillet and then added the garlic. I let the garlic cook for about 30 seconds and then added the orange bell pepper. After the pepper had fried up a bit in the butter, about 5 minutes, I added the cabbage and let that cook down for another 5 minutes. 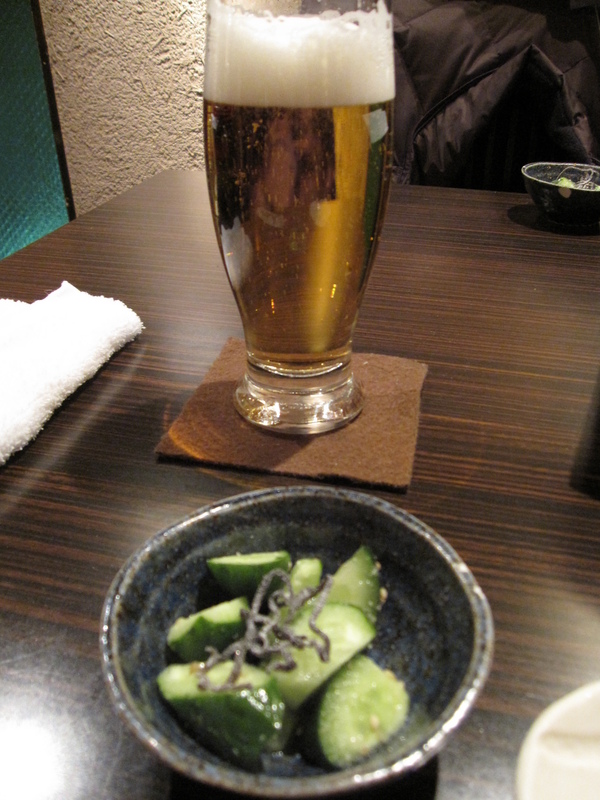 In came the soy sauce with some black pepper. 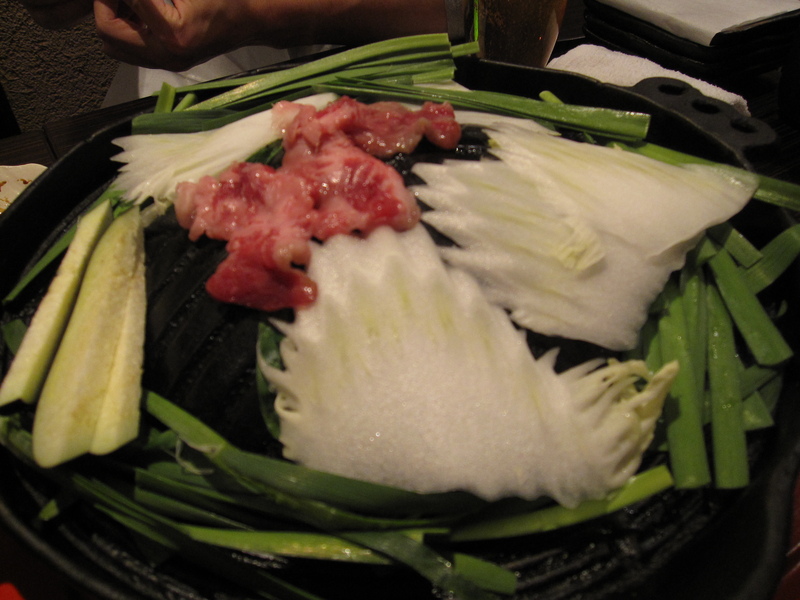 When the soy had cooked off, just a couple of minutes, I added the bean sprouts. The sprouts have enough water so that you don’t need to much soy. When it was all cooked down for a few more minutes it was ready. 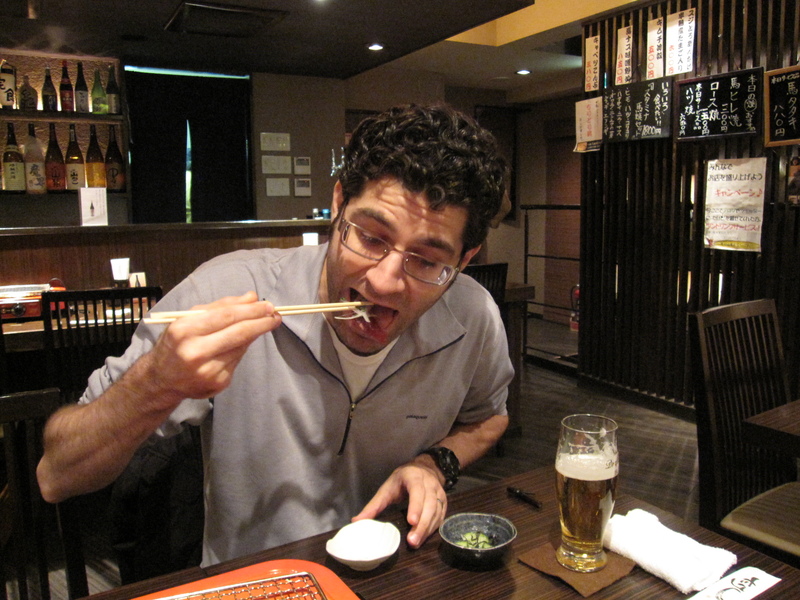 Of course, we had white rice along for the ride. 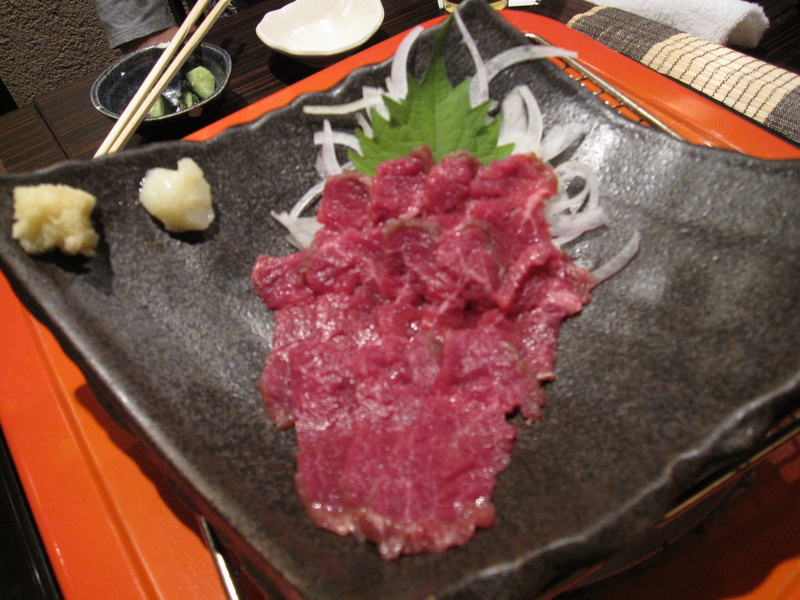 The other night Yuki made dinner. We had some bok choy and a daikon that needed to be used up, so Yuki did her magic in the kitchen while I sat back and drank beer. Well, that’s not entirely true. I did prep the veggies for her because I love to use knives! 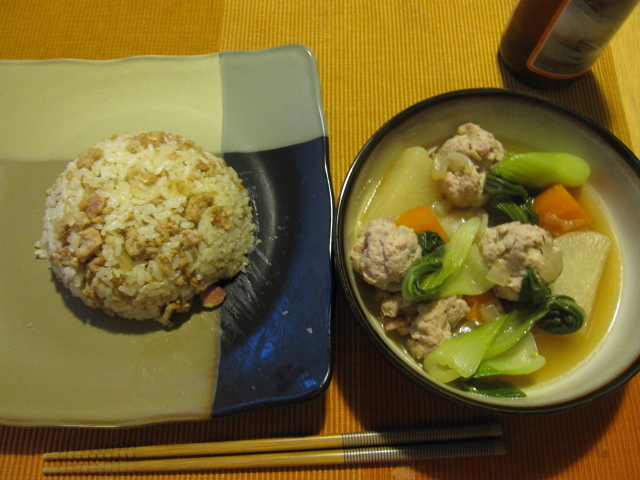 I cleaned up 3 bok choy, minced 3 garlic cloves, skinned 1 daikon and one carrot, and got out 1 lb of ground chicken thigh. 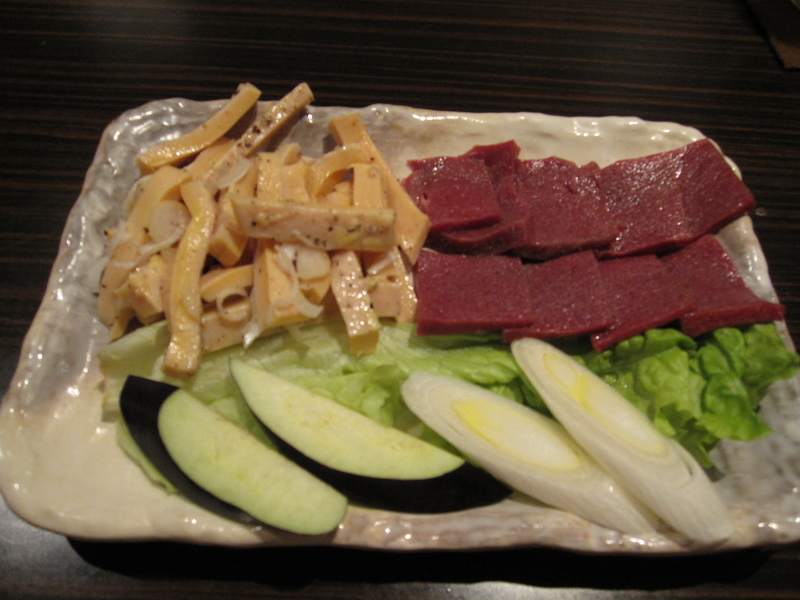 I let her cut the daikon and carrot because I wasn’t sure how she wanted them cut. She was too busy feeding Otis to tell me, so I just let her go at it. After getting everything ready she did ask me to dice 1/2 onion, that didn’t make the pic. 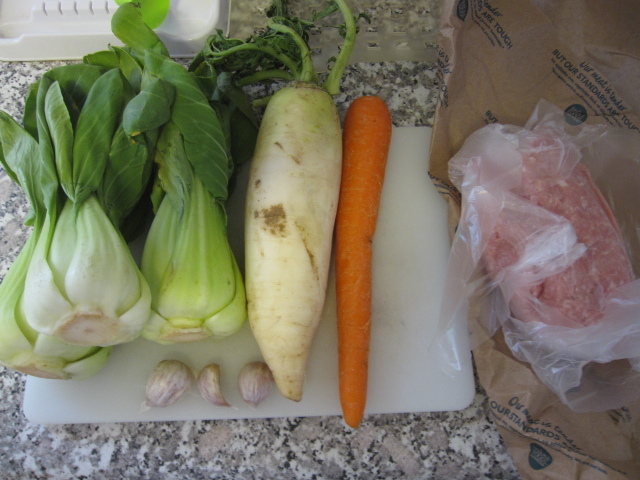 She ended up cutting the daikon into half moons and just chopped the carrot. I’m not exactly sure about some of the measurements, but I think she simmered 1/4 cup fo bonito flakes in about 2 cups of water to make a nice dashi. 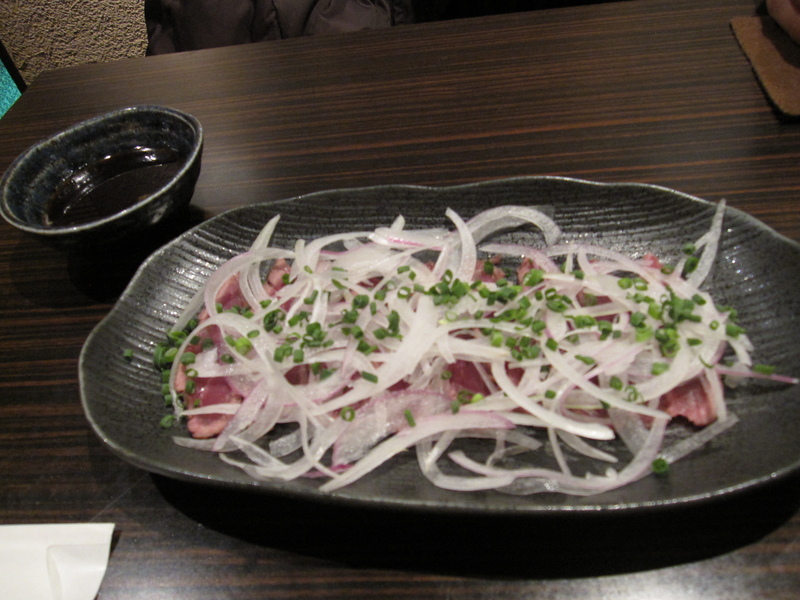 In a glass bowl she mixed together the meat with the garlic and onion. She wanted some ginger, but we didn’t have any and I forgot to get some at the store. Mind you, she didn’t request that I get some, but somehow I think it’s my fault, it always is. 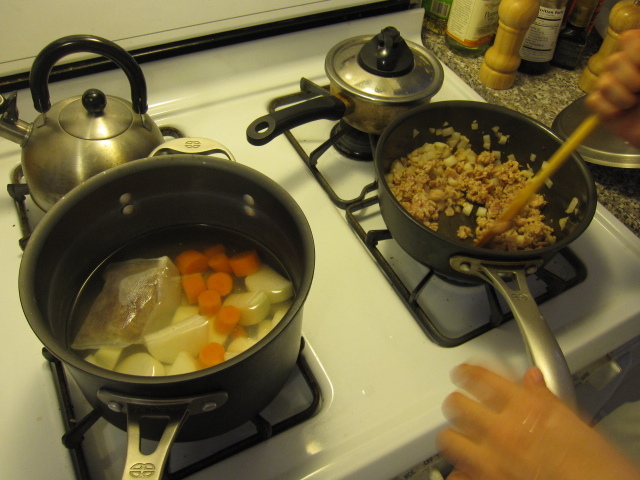 After letting the bonito flakes simmer for about 10-15 minutes she added the daikon and carrot. 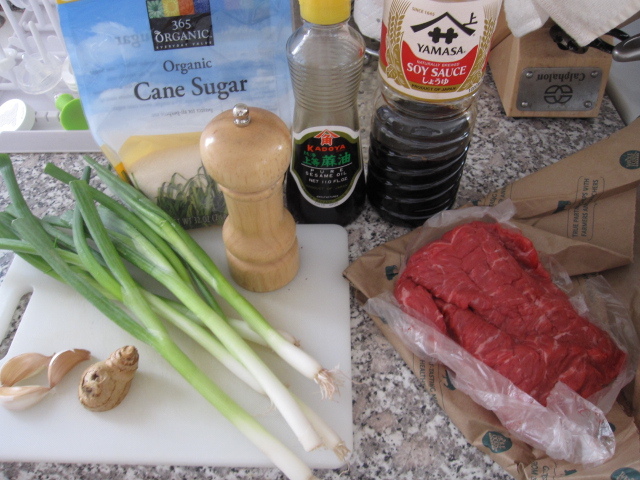 Then, she poured in about 2 tablespoons of soy sauce, 1 tablespoon of sake, 1 tablespoon of mirin, and a pinch of sugar. Again, just estimates on her measurements, but probably not too far off. While that was all simmering she cooked up about half of the chicken mixture. 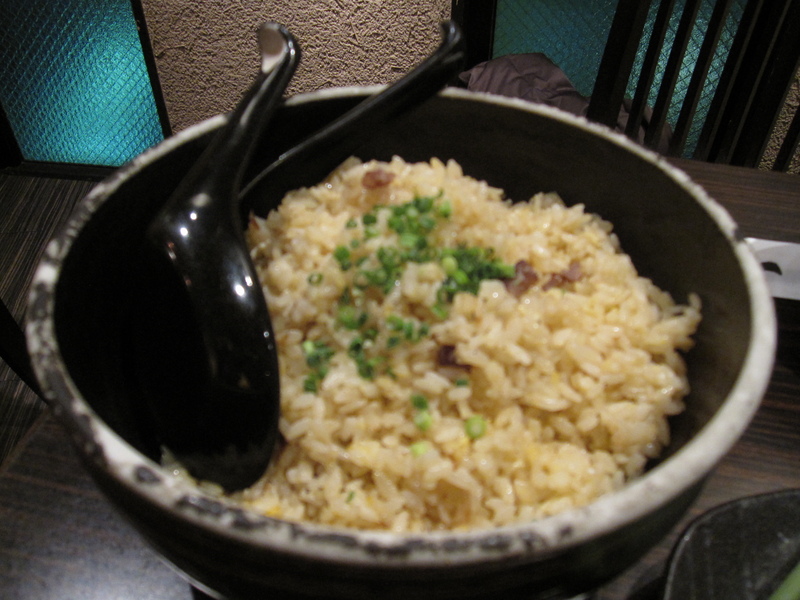 Once it was cooked through she mixed in about 1 cup of cooked rice and some black pepper, making sort of a fried rice. 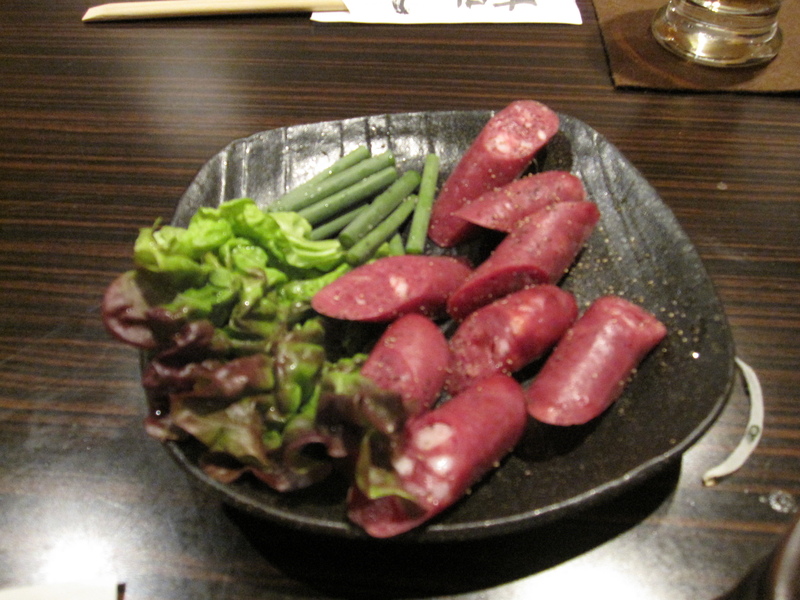 That was served as one dish. 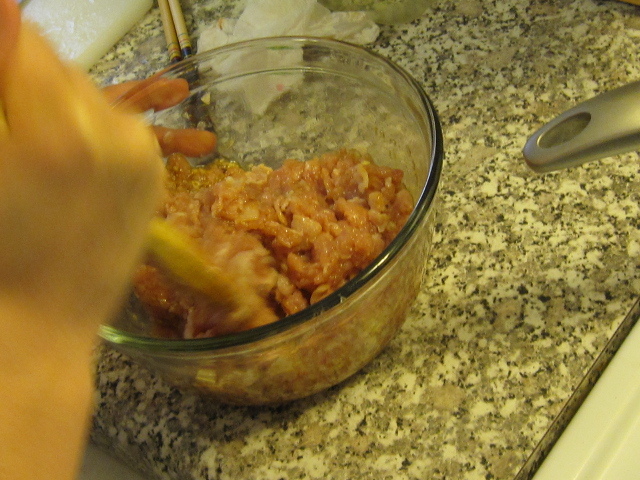 She used the rest of the chicken mixture to make meatballs. 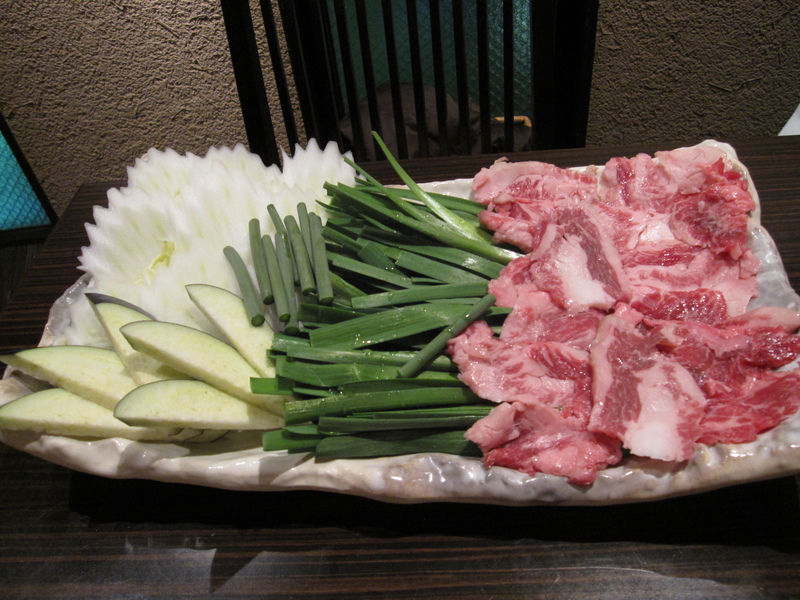 They were dropped into the dashi after the daikon and carrot had simmered for about 15 minutes and became tender. Once the meatballs were cooked through, about 6 or 7 minutes, she added the bok choy and let it cook for a few minutes. That was all she wrote, or cooked. It was mighty tasty. 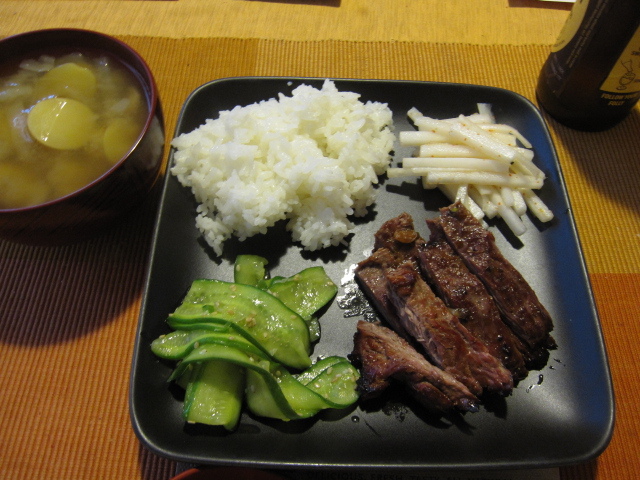 I love how she used an empty teabag to simmer the daikon. 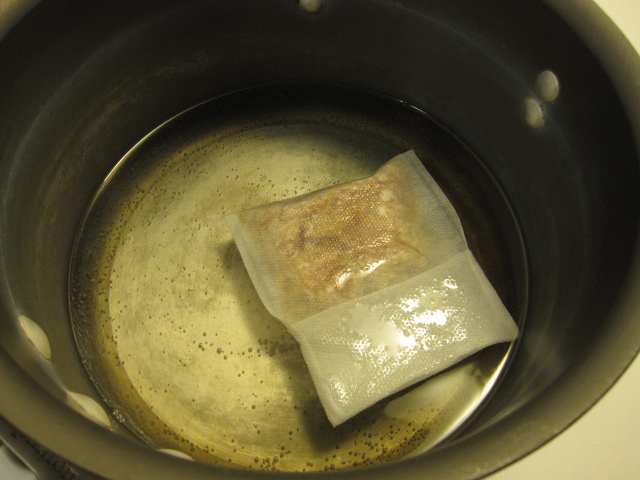 That way she didn’t have to strain the dashi, she just had to remove the bag. I got the fun job of trying to clean the bag afterwords so we can use it again. I prefer using my knives! Since I cooked a few meals for Yuki’s parents when they were in town I thought it was only fair to cook one for my mom last night before she left this morning. Being a woman who could make a meal out just naan, I thought something with Indian curry would be a good idea. She had requested seafood, so I picked up some salmon. 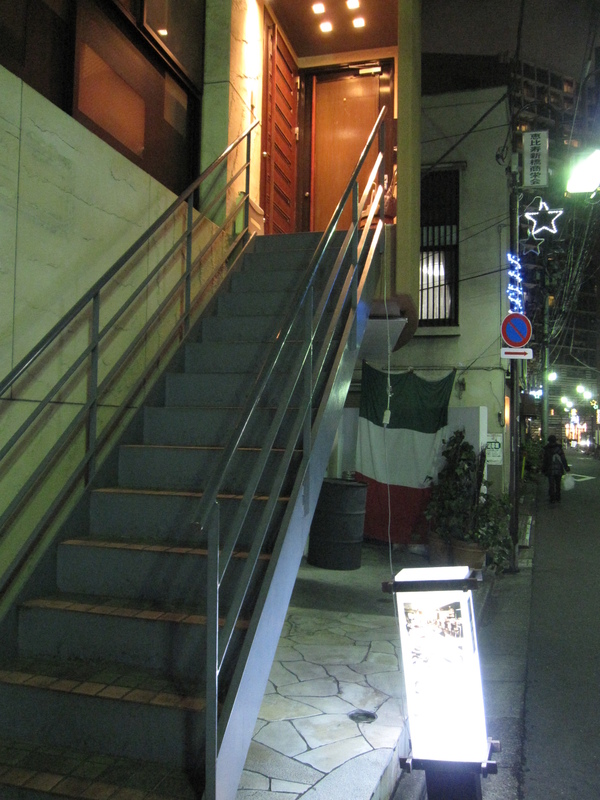 It all came together as the dish you see above. I made the lentils first. I used about 1/3 cup of cilantro chopped up, 1 inch of ginger minced, 3 garlic cloves minced, 1.5 cups brown lentils rinsed, 2 carrots diced, 2 ribs of celery diced, 5 small red potatoes diced, 1/2 onion diced, 1.5 tablespoons of curry powder, 1 cup of chicken stock, and a 14oz can of diced tomatoes. I heated my pot up, poured in about 2 tablespoons of olive oil, then threw the ginger and garlic in for about 30 seconds until they became very aromatic. After that I added the onion, carrots, and celery. I let them sweat down for about 5 minutes and then added the potatoes. I didn’t want to cook the potatoes too much to keep them from melting in the chicken stock, so I only stirred them around for a few seconds to coat them with the oil. Then I added the can of tomatoes, curry powder, some salt, and pepper. 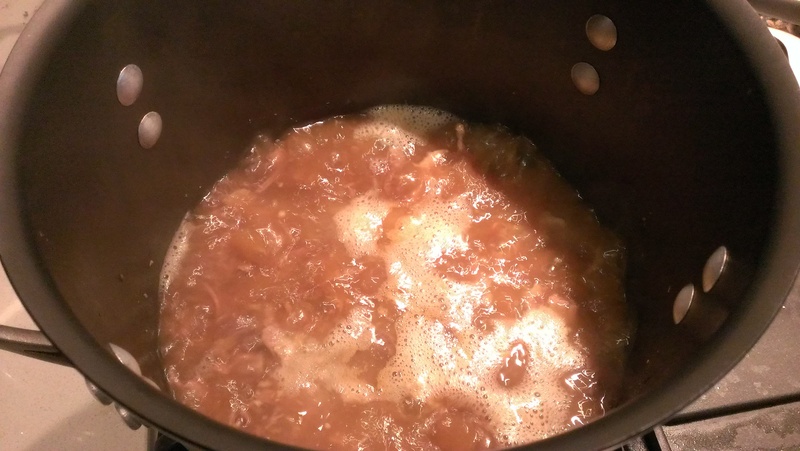 Once the tomato juice started to boil I poured in the chicken stock. 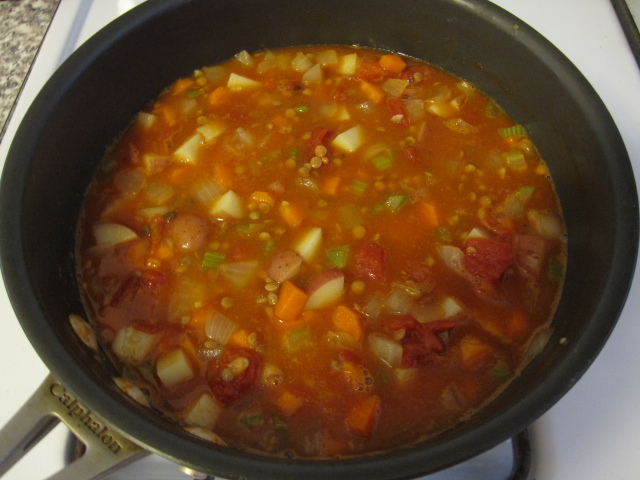 When that started to boil I added the lentils. 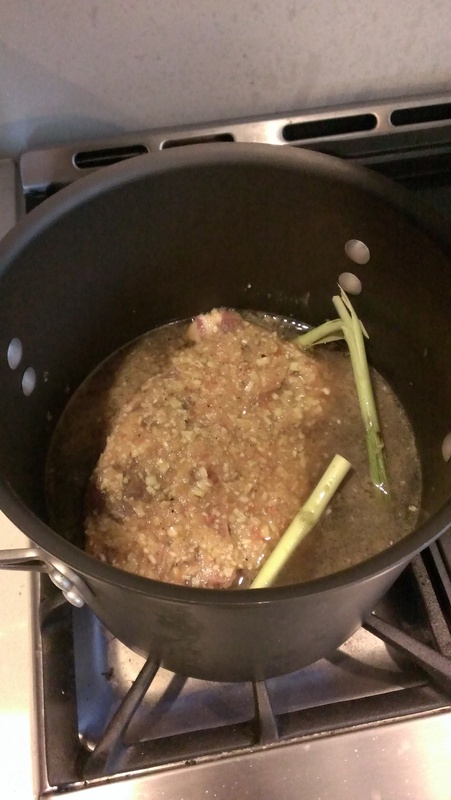 I let it come back up to, you guessed it, a boil and then covered the pot and turned the heat down to med-low. I let it simmer for about 20 minutes. 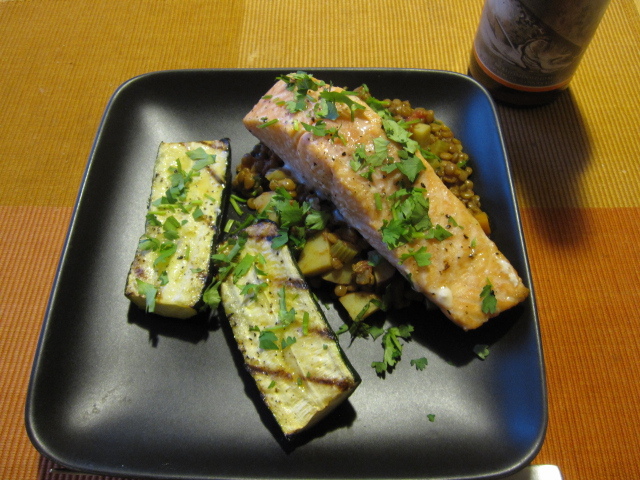 While the lentils were simmering I grilled up the salmon and zucchini. 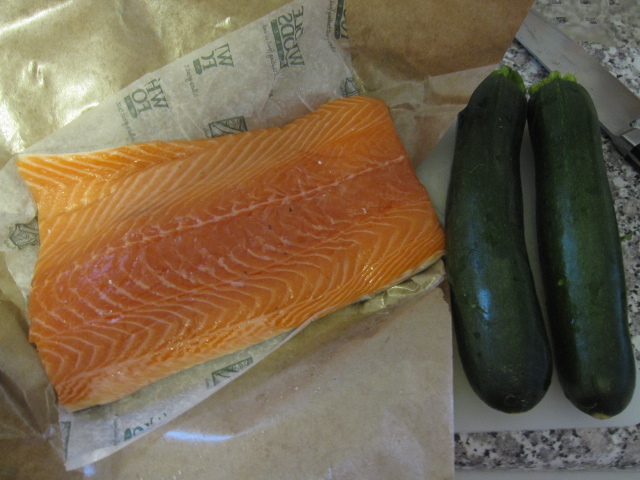 I had a 1.5 pound salmon filet (enough for 5 portions since my brother was also here and I needed a piece for Yuki’s lunch today) and 2 large zucchini. I cut up the salmon into equal portions. 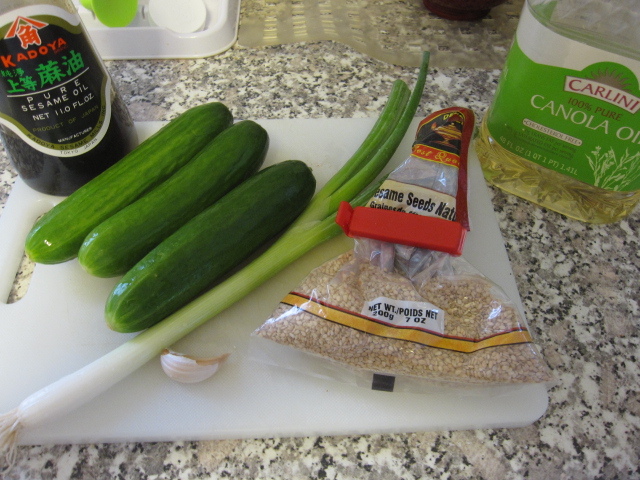 I sliced the zucchini in half lengthwise and cut them into 2 inch pieces. I drizzled olive oil, salt, and pepper over everything. 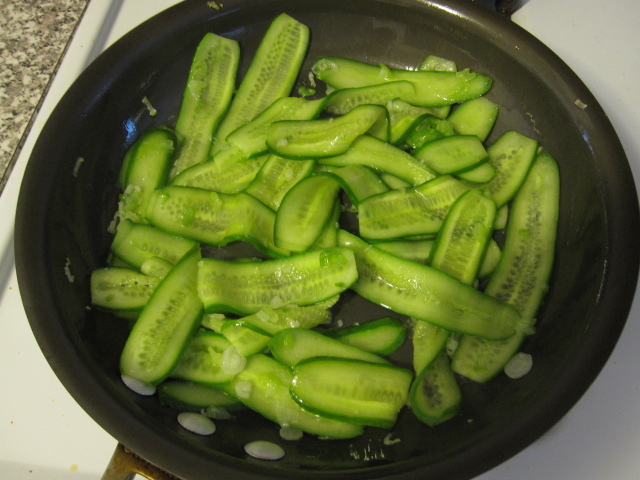 I put the zucchini on the grill, cut-side down, over med-high heat for about 5 minutes. This gave it nice grill marks. Then, I moved it to the top rack flipping it over. I put the salmon on the bottom rack, skin-side down, and turned the heat down to medium. I let it cook for about 7 minutes or so. This really gave the skin a nice crisp while leaving the flesh beautifully medium. 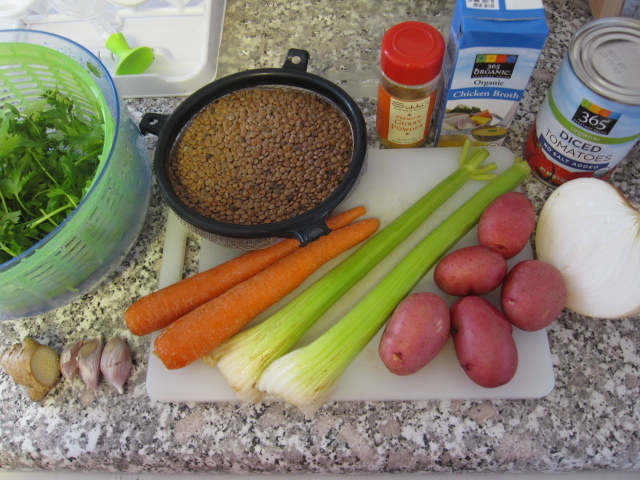 When the lentils were done I removed the lid, re-adjusted the seasoning, and stirred in almost all of the cilantro. 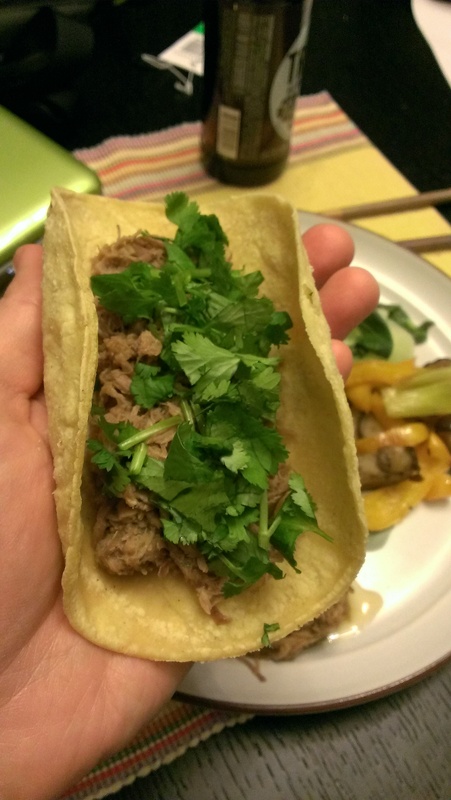 I plated everything up and then garnished the entire plate with the rest of the cilantro. With 4 clean plates about 30 minutes later I’ll assume dinner was a success.